Joe Greswell conceded that Nettleham deserved the three points as they beat Wyberton 3-1 on Saturday. Curtis Revell slotted home a penalty for the Colts, but it was scant consolation for the away side in this Lincs League fixture. 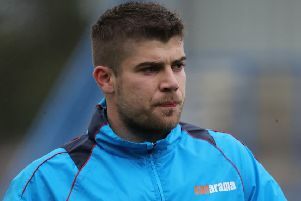 “It was just a frustrating day from start to finish,” boss Greswell said, after losing striker Nath Wright in the warm-up. “Saying that, we still thought we had enough to get three points, but it wasn’t to be. “Unlike other weeks, I was very happy with our first-half display. It took us 15 minutes to settle into the game but defensively I felt we were comfortable. “In the second half we just downed tools and, for some reason, when they scored early our heads dropped and we just didn’t recover. Nettleham took the lead from a long range effort after a Nettles player found himself unchallenged and decided to try his luck. The ball took a nasty bobble and skipped up over James Doughty’s hand. Wyberton drew level from a Revell penalty after Jamie Elston was brought down. The hosts scored their second five minutes into the second half. A clever backheel found a striker who went through one-on-one against Doughty and slotted home to give his side the lead. The third and final goal came on the hour mark when a well-placed shot from the edge of the box found its way into the Wyberton net. The Colts saw a second ruled out for offside after a Nicky Frost free kick went straight into the net but the referee’s assistant judged that a Wyberton player was in an offside position and in the keeper’s eyeline. Wyberton are without a fixture this weekend.